-“What is a Sin ?” – His eyes where absolutely fresh. There was a sparkle of innocence, all around his face. He looked at my eyes straight. For, few minutes there was no word. I kept my silence , took my plate, and slowly walked towards the table . He followed me. In Akash, you have to collect the glass on your own. A mirror was set , just next to place, where the set of glasses were kept. While I was collecting the glass , for drinking the water, I could see his face, with a little uneasiness in the mirror. After collecting the glass, and filling it up with water, I moved to my table. Rajan, came with all different foods they prepare for thali, on lunch . He gave small size pots , each had a separate soop . Normally , there was five pots , but today it was four . This was an interesting phenomenon, which I observed here, that the number of pots and food items, became always lesser, with the growth of the visitor in the restaurant. As Rajan, was putting the four pots in my table, he came and sat on the chair , next to me, looking at me. -“What is a Sin ? ” . He asked again. -“ Depends “ .. I start looking at the wall , that I can avoid the discussion and quickly get into my meal. Normally , I prefer to eat my meal quietly. But he is insistent to engage me into a discussion , and before he can put his next spell of question , I ask him “ What is your definition of sin ?” putting the dal from the pot to the rice .. I filled my mouth that I can avoid any further question for some time . Though I know it is difficult to persuade him to remain quiet. I have tried earlier and failed. -“ I never tried to define it” .. He answered with a sprinkle of smile. Today he has a very colourful shirt with a very dirty looking pajama. After being transferred here, as a English teacher of a School , he has made “Akash Shesadri Resturant” as his permanent lunch destination. -“ You see it’s a state of mind . Everybody is a sinner, at the same time everybody is also holy” replied Dr Biswas, 57, with a smile, which displays presence of innocence has not taken, his keen intellect away. After knowing, that I teach Surya Yoga, and came here with my students to do Guru Poornima Retreat, 1 he has started coming with all types of questions. Though originally, he is looking for a better place to stay in Tiruvannmalai , with a lesser price, which he thinks , I can arrange very fast, with a number of students, who come to me , for taking lessons in Surya Yoga. -“ Do you also teach philosophy apart from English” I was little taken aback with a reply, which can have such a deep interpretation . -“ Right you are . Infact, lot of people , comes here to get rid of their sins they have committed . You can find, lacs of people here in the full moon day . You can’t even sit in these restaurant, in any full moon day . But deep down , as you said , its our `identification to a sinner` that makes us sinner. Infact , everything we do can become sin , if we have identified ourselves on doing it . The moment we can practise surrender, there is no sin , as we cannot be identified as “doing it “, or, nor can we be identified as “not doing it” . Krishna , in Bhagvad Gita , calls these position , as “Niskam Karma” . – “ Very Interesting “ Dr Biswas has almost stopped eating . I asked him to continue with his lunch, and join me in the evening, while we go for walk, around the mountain. At evening , we start our walk form Kali Amma Temple,which is just next to Akash Seshadri Resturant, where we are having the lunch, in afternoon. – “ My age is now a perfect time to reach kashi, and listen to the words of holy men and prepare for death. But here I am , even my two sons living in US , and wife working in a College , doing all kind of “sinful activity by identifying myself as a teacher” – Dr Biswas commented taking a jib on my comment i in the afternoon. – Dr Biswas smiled at me and looked on the road ahead. 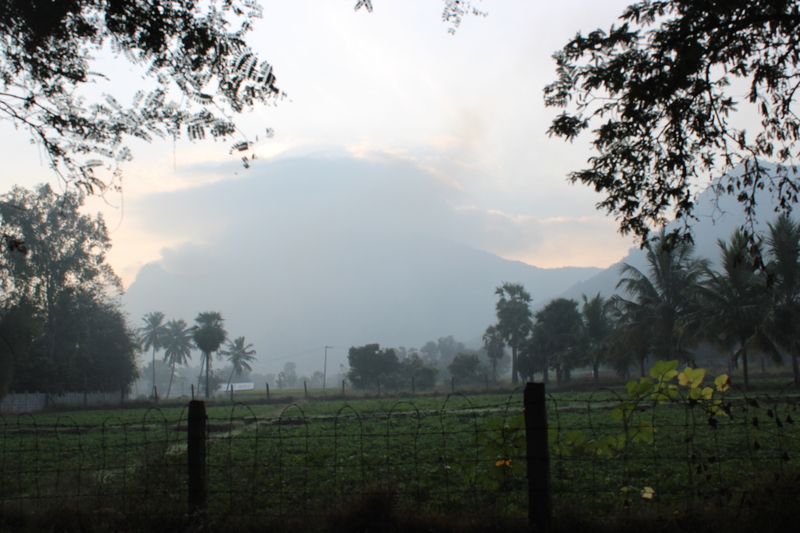 I started to read some parts from Arunachala Mahatamaya , what Arunachala has to say , on how sins can be removed while circumambulating Arunachala..